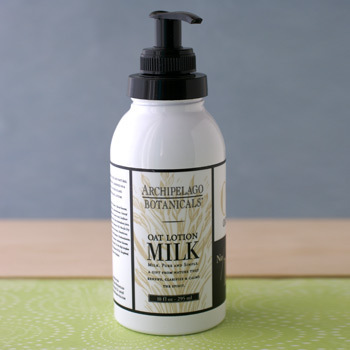 Archipelago's Oat Milk Lotion is reminiscent of Grandma's oatmeal bath, Archipelago Botanicals' oat skin care is hydrating, soothing & gentle to the skin. Perfect for dry, rough or irritated skin, nourishing dried milk solids and gentle oat proteins are blended with our award winning body lotion formulation - leaving your skin supple and soft to the touch. Contains jojoba esters for smooth, non-greasy application18 oz. / 1532 mil.